Today, we’ll introduce Hyundai Rotem, a manufacturer of railway vehicles. The company has recently won an order to supply diesel-electric train units to Bangladesh with its outstanding technology, beating its global rivals. Let’s hear from Chung Byung-joon from the Public Relations team at the company. Hyundai Rotem has received an order worth 41 billion won to provide 10 diesel-electric locomotives to Bangladesh Railway. It is roughly 38 million US dollars. In a diesel-electric locomotive, a diesel engine is connected to a generator to create electricity that powers traction motors. So it can run on tracks without electric streetcar lines. We won the order from Bangladesh, beating manufacturers of railroad cars from China and Spain. We have supplied passenger cars and diesel-electric locomotives to Bangladesh since the 1970s, and the local government has recognized our technology and quality of our products. Unlike the diesel-electric locomotives that we have previously provided, the new ones we’ll manufacture will conform to European standards for collision, use fire-resistant materials and improve safety. They will offer 2,200 horsepower, 565 more than the existing ones. Spain has the largest market share in rolling stock market in Central and South America, and China is emerging as a rising power in the global market. But Hyundai Rotem beat the two strong contenders to supply its products to Bangladesh. The Korean firm has received orders of a total of 333 train cars from the South Asian country since 1978 when it provided 101 cars. 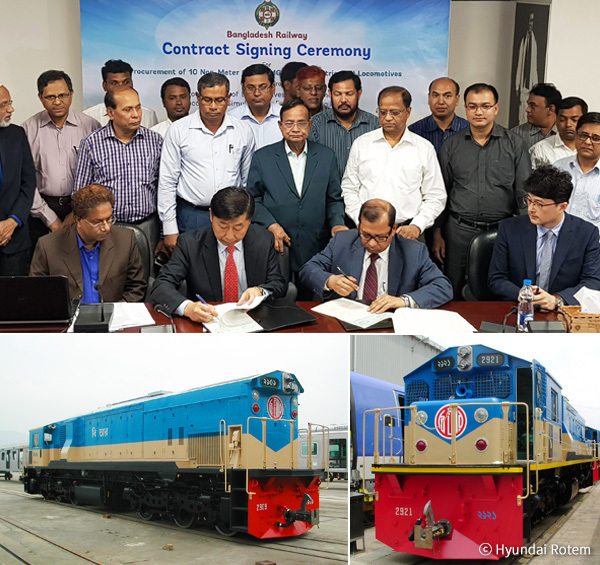 The contract the company signed with the Bangladesh railway authorities last month proved its competitiveness once again, with the Korean company now supplying 23 percent of entire train cars possessed by Bangladesh and 17 percent of diesel-electric locomotives. The company was founded in 1977 in the name of Hyundai Precision & Industries. 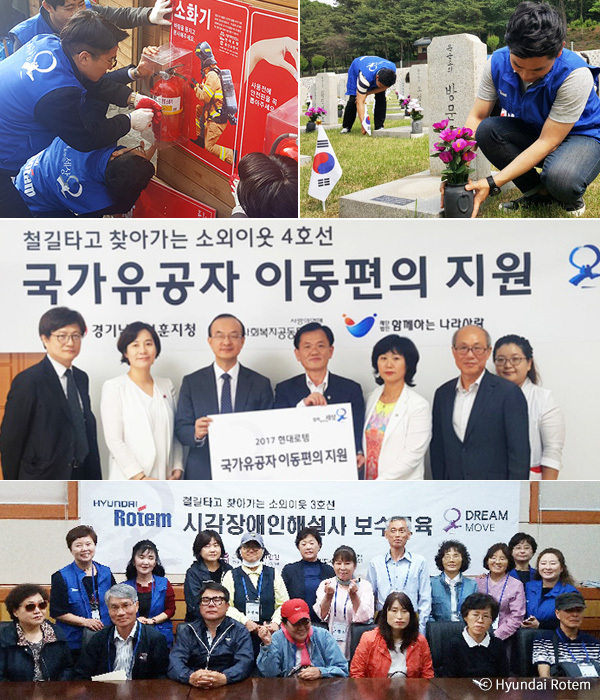 To strengthen South Korea’s competitiveness in the global market, three major rolling stock divisions—Hyundai Precision & Industries, Daewoo Heavy Industries and Hanjin Heavy Industries—were merged into a single corporation in 1999 to give birth to Hyundai Rotem. Currently, the company has a factory capable of manufacturing 800 train cars annually in Changwon, South Gyeongsang Province. Our factory in Turkey can produce 100 cars each year, while another factory in the U.S. can make the same amount of cars. We also operate a factory in Brazil, where 200 cars are manufactured every year. So, we have built a global production system with an annual production of 1,200 railroad cars. The factories produce most of South Korea’s railway vehicles, including subway trains, light rail vehicles, high-speed trains, locomotives and diesel multiple units. Based on our production capacity, we’re expanding our business to overseas markets. 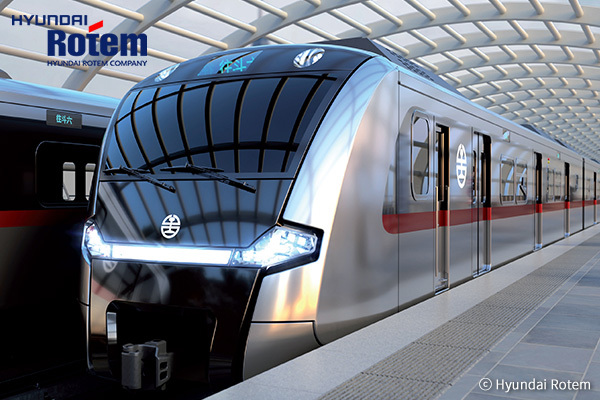 Hyundai Rotem is South Korea’s only rolling stock manufacturer to offer integrated solutions for the railcar business by producing railway vehicles, including high-speed trains, magnetic levitation or maglev trains and subway trains, and also managing and renovating railway systems. In addition, the company operates its defense systems featuring combat vehicles and specializes in engineering, manufacturing and commissioning in the field of steelmaking facilities, auto manufacturing facilities and power plants. It is one of the world’s top five players, in terms of rolling stock production. The company produces core electric and electronic units for railway vehicles with its own technology to supply its products to the entire world. We’re exporting various types of railway vehicles to 36 different countries in Asia, the Middle East and the Americas. We’ve recently received orders of supplying diesel multiple units to Iran and metro cars to Canada, Turkey and India. In 2016, we were able to enter the Australian market by signing an 890 billion won contract to supply double-decker trains to Sydney. That’s about 800 million US dollars. In the same year, we won the order of the railcar project for the Manila Metro Rail Transit System Line 7. Apart from producing railway vehicles, we also handle railway systems involving car maintenance, signaling and communications. As a global rolling stock manufacturer, Hyundai Rotem boasts advanced technology and vast experience. But the company refuses to settle for the present. It is striving to develop new products that will lead the rail vehicle market in the future. The company has made constant efforts to contribute to the development of the railway industry since its foundation in 1977. Starting with locomotives and freight cars in the 1970s, we have produced high-speed trains, subway trains and light rail vehicles that are used by citizens every day. But we’re also concentrating on research and development of futuristic railway vehicles, including maglev trains and unmanned vehicles. The company is keenly aware of the importance of the railway industry as one of the nation’s key industries. All the employees at the company are trying their best to supply high-quality train cars and railway systems that will hopefully satisfy customers. The company is paying attention to economic cooperation between South and North Korea. When security conditions stabilize on the Korean Peninsula following the recent inter-Korean summit, the two Koreas may push for a cross-border railroad project and also the Eurasia railway project that would connect Korea with Russia and even Europe. Hyundai Rotem is preparing for a hopeful era, where South Korean-made trains will depart from Busan and run all the way to Europe via Seoul and Pyongyang.